Knowledge Management is now, in some industries, old enough that that leaders "grew up" with KM as a resource. What difference does this make? been doing KM. Data from the 2014 Knoco KM survey. We are many of us familiar with organisations where KM is a new discipline, and where leaders need reassurance that KM will add value. But what about where it is no longer new? 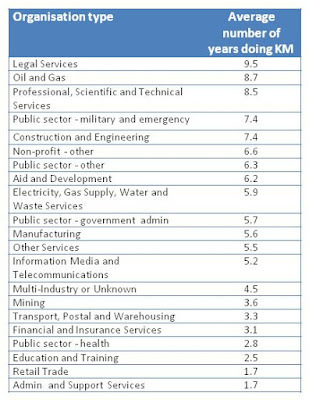 In many industries, as the table above shows, KM has been in place for nearly a decade (this table was created in 2014), and in some companies for nearly 2 decades. That is long enough for managers to have come up through the ranks with KM already in place. So what difference does this make to leadership attitudes? Here are two stories; one positive, and one less positive. I talked recently to a knowledge manager from a company who has been working with knowledge management for over 15 years, and has developed an enviable reputation for having for the backing of senior management for their knowledge management initiatives. She was explaining to me about their long term approach for communities of practice, and how over the 15 years, many of the initial community leaders have now been promoted into senior management posts. They are beginning to really reap the benefits of this, as the new generation of senior managers have “grown up” in the organisation with knowledge management being a way of life. As a result, these managers see KM not as something extra, or as a new initiative, but this or part of the natural way of working. They have been there, they have been involved, they have seen the benefits, and knowledge management for them is now as natural as financial management or safety management. For these managers, KM is "part of the job", and they expect their staff to do KM. Then earlier this week I had another conversation, which perhaps shows a potential downside. In this company, KM has been running since the late 90s, with Communities of Practice being a very powerful mechanism. However the CoP forum is still running on late 90s technology, and really needs an upgrade. Unfortunately the managers, who came up through the ranks using this forum and know it to be a massively valuable resource, are saying "Don't mess with the forum. Whatever you do - don't compromise its effectiveness". In many ways I sympathise with them - upgrading technology for the sake of it can be risky and if something continues to do the job needed, then why not stick with it. However in this case, they may well be standing in the way of needed progress. When leaders grow up with KM, their support is assured, but make sure they do not stand in the way of KM developing even further.